What was the key to Allied victory in World War II? More importantly, why are things now going so badly for the British and American peoples? JUNE 6, 1944 — just a brief 40 years ago this summer — was one of the decisive dates in history! On that day General Dwight D. Eisenhower from headquarters in southern England sent more than 250,000 Canadian, American and British soldiers across the treacherous Channel to commence a "Crusade in Europe." It was the greatest combined assault in history: more than 3,300 assault ships and landing craft — supported by 11,400 aircraft, six battleships, 21 cruisers, countless destroyers, artificial harbors, down to grappling hooks and innumerable silk scarves with maps showing. enemy positions. The stakes? Colossal. A bungled Allied invasion of the French coast would mean a chance for Hitler to withdraw troops from the West to meet the Russian onslaught; time, too, for the Nazis to perfect new superweapons like the V-1 and V-2 missiles that were to terrorize London that same summer. The world has become familiar with the official story of D-day, June 6, 1944, the "Longest Day." Yet the behind-the-scenes story is even more remarkable, and offers convincing evidence of the part a great unseen Hand has always played in history, and especially in the history of the Anglo-American people. Forty years later, it is time for that story to be retold — the plain truth about D-day. It is also time to ask a more pertinent question: Why is it that this guiding Hand seems missing from the English-speaking world today? "The final conference for determining the feasibility of attacking on June 5, was scheduled for 4:00 a.m. on June 4.... Some of the attacking contingents had already been ordered to sea.... On the morning of June 4 the report we received was discouraging. Low clouds, high winds, and formidable wave action were predicted to make landing a most hazardous affair. The meteorologists said that air support would be impossible, naval gunfire would be 'inefficient, and even the handling of small boats would be rendered difficult. "At three-thirty the next morning our little tent was shaking and shuddering under a wind of almost hurricane proportions. It seemed impossible that in such conditions there was any reason for even discussing the situation. Bad conditions predicted the day before for the coast of France were actually prevailing there and if we had persisted in the attempt to land on June 5 a major disaster would almost surely have resulted. This [the Meteorologic Staff] told us to inspire more confidence in their next astonishing declaration, which was that by the following morning [June 6] a period of relatively good weather, heretofore completely unexpected, would ensue, lasting probably thirty-six hours. The long-term prediction was not good but this short period of calm weather would intervene between the storm we were then experiencing and the beginning of the next spell of bad weather. "I quickly announced the decision to go ahead with the attack on June 6" (Crusade in Europe, Da Capo edition, pages 249-250). In spite of the best efforts of man, the D-day battle — like so many in history — lay at the mercy of the weather. Humbling, but true! "As the old adage had it, 'Man proposes but God disposes.' There comes a point in so many of our affairs at which we hope so often for a miracle. "And miracles happen still. How many of them have we not seen enacted before our eyes in these past few years.... There was Dunkirk and its fiat, calm sea. Who planned that? During those fateful hours I was riding up to battle, south of the Somme... our main army was hemmed in on those northern beaches. There were many others who, like us, saw no way out barring a miracle. There came a miracle. "Then, two years later, a U-boat caught sight of the tail ship of one convoy [carrying troops from America and Britain to invade North Africa]. The German observer, apparently, thought what he saw merely worthy of routine report. "Then, but a day before Gen. Patton was due to land on the Casablanca beaches, open to the full Atlantic swell, just as it seemed inevitable that his whole affair must be called off, the wind changed from on-shore to off-shore and let the small craft in. "The history of our other theatres of war will inevitably tell of many similar happenings, but I doubt if any will be such as to compare with the miracle of D-Day in 1944.... There had already been one short delay, caused by bad weather, which meant that any further postponement must have been of weeks to await the right conjunction of light and tide.... There was something more than ordinary, surely, in that decision to attack and in that spirit of success that permeated the ranks." "It seemed that those normally placid and sunlit days when May and June mingle were this summer malignantly possessed.... And yet all the time, had we but known it, the clouds we so much dreaded were big with opportunities Supreme Headquarters were quick to grasp. "The German commanders were advised by their meteorological service that there could be no invasion in the period including June 6 because of continuous stormy weather. That is why D-Day forces landing during a brief break in the windiest month in Normandy for at least 20 years found so many German troops without officers, and why other enemy coastal units were having exercises at the time of the landing." This was the miracle of D-day! Even General Erwin Rommel, the brilliant Desert Fox, was not at his post. He was visiting his wife for her birthday — June 6. Rommel was confident the treacherous weather made an invasion impossible. The odds were 50 to 1 against moon, tide and winds being right after the stormy weather that was raging. The Times commented again on October 27, 1944: "It has perhaps never been fully appreciated how near the invasion forces came to a disaster comparable with the fate of the Spanish Armada." June 18 was the next time for the right tides. Yet on June 19, a gale rose with increasing force for the next 24 hours and died away 1 1/2 days later. Only one of 23 tons of pier equipment survived that fateful episode. It was the worst Channel storm in 80 years! What if the invasion had come on Sunday, June 19? It is a chilling thought. "This day eight years ago, I made the most agonizing decision of my life. If there were nothing else in my life to prove the existence of an almighty and merciful God, the events of the next twenty-four hours did it.... The greatest break in a terrible outlay of weather occurred the next day and allowed that great invasion to proceed, with losses far below those we had anticipated." "I sometimes have a feeling of interference. I want to stress that. I have a feeling sometimes that some Guiding Hand has interfered. I have a feeling that we have a Guardian because we have a great Cause, and we shall have that Guardian so long as we serve that Cause faithfully." "It suddenly started to blow, a real blow, force 6, half a gale. This meant that the surf would be terrific, and it would be almost impossible for our landing-craft to force their way through. In spite of all the elaborate precautions: here we were, at the mercy of the elements. "But there was no turning back now, and as the darkness closed down and the ships ploughed on, I couldn't help thinking of some of the miracles of weather which had already favoured us in this war: Dunkirk; North Africa. Perhaps three times was too much to expect. Perhaps... and then it happened. With barely an hour and a half to go before zero hour the wind suddenly dropped and the swell went down quicker than I have ever seen before. It was so sudden it was almost unbelievable, miraculous, and as people stared into the darkness many a silent prayer of thanks was offered up." In Sicily, as in Normandy, the enemy garrisons were lulled into a false sense of security by the foul weather that suddenly cleared! How providential for the Allies! But D-day — the opening of the Second Front — was pivotal to World War II. It hastened the Nazi defeat before Hitler's scientists could perfect the hydrogen bomb. After the triumphant Allied sweep through France in 1944, Field Marshal Bernard Montgomery felt compelled to say: "Such an historic march of events can seldom have taken place in such a short space of time.... Let us say to each other, 'This was the Lord's doing, and it is marvellous in our eyes.'" Stirring events these! Yet tough, realistic military men were never bashful about bringing God into the picture. And with good reason. Weather is no minor factor in warfare. The tragedy of Arnhem and the Battle of the Bulge the fall and winter following D-day were grim reminders of the folly of relying solely on human calculations and material strength. The massacre of the Second Canadian Division at Dieppe in August 1942, was a tragic lesson in how amphibious operations can backfire disastrously. Persistent fog in April 1941 helped two of Germany's battle cruisers, Scharnhorst and Gneisenau, to escape through the Denmark straits to devour 115,000 tons of Allied shipping. The Bismarck almost eluded her British adversaries in the fog that same year. World War II saw one of the most dramatic weather interventions in history, the harsh Russian winter of 1941 that pummeled Hitler's legions outside the very gates of Moscow! How differently might history have turned out without the perennial overruling factor of the weather (Job 38:22-23). "[In the United States] there was a somber, religious mood.... For one entire week the most boisterous, noisy, rambunctious people in the West went about with a restraint, a soberly responsible sense of purpose, that was not only striking, but without parallel in living memory. As an emotionally unifying, satisfying experience it was unique. It was the unity not of grief, but of accomplishment and hope" (Geoffry Perrett, Days of Sadness, Years of Triumph, page 277). "Almighty God: Our sons, pride of our Nation, this day have set upon a mighty endeavour, a struggle to preserve our Republic, our religion, our civilization, and to set free a suffering humanity. "They will need Thy blessings. Their road will be long and hard. The enemy is strong. He may hurl back our forces, but we shall return again and again. "They fight not for the lust of conquest. They fight to end conquest. Help us, Almighty God, to rededicate ourselves to renewed faith in Thee, in this hour of great sacrifice. "Many people have urged that I call the Nation into a single day of special prayer. But because the road is long and the desire is great, I ask that our people devote themselves in a continuance of prayer." "That we may be worthily matched with this new summons of destiny, I desire solemnly to call my people to prayer and dedication. We are not unmindful of our own shortcomings, past and present. We shall ask not that God may do our will, but that we may be called to do the will of God; and we dare to believe that God has used our nation and empire as an instrument for fulfilling His high purpose." Here, certainly, is a little — known part of the untold story of D-day. And it was not just the national leaders who felt the need for prayer. Forty-eight hours before invasion, at Portsdown Parish Church, General Dempsey, Commander of the British and Canadian forces on D-day, sat for one hour with 400 officers and men through "one of the most moving experiences of my life." Sir Francis Drake's famous prayer before the battle of Cadiz was recited: "O Lord God, when Thou givest to Thy servants to endeavour any great matter, grant us also to know that it is not the beginning, but the continuing of the same, until it be thoroughly finished, which yieldeth the true glory; through Him that for the finishing of Thy work laid down His life, our Redeemer, Jesus Christ." In such a spirit, did the great crusade in Europe begin, shocking as this may seem to a skeptical generation. The parallels between the spiritual preparations and godly consecration of the English-speaking world on the eve of D-day and the customs of the ancient 10 tribes of the House of Israel are striking indeed. "When you set out to make war upon your enemies, and see... an army larger than yourselves, you must not be afraid of them, for the Eternal your God... is on your side. When you open the campaign, a priest must approach and address the army thus: 'Listen, Israel, you are opening a campaign today against your enemies; never lose heart, fear not, tremble not, be not afraid of them, for the Eternal your God goes with you, to fight for you against your enemies and to give you the victory'" (Deut. 20:1-4, Moffatt trans.). "Or if Your people Israel are defeated before an enemy because they have sinned against You, and return and confess Your name, and pray and make supplication before You... then hear from heaven their prayer and their supplication, and maintain their cause" (Revised Authorized Version throughout, except where otherwise noted). "'Hear, O Israel: Thou art to... possess nations greater and mightier than thyself... a people great and tall of whom thou hast heard say, who can stand before the children of Anak! "It seemed a message full of reassurance" (Mentor edition, pages 58-59). This was the same Churchill who at the victorious conclusion of World War II, as Prime Minister, led the entire British House of Commons to "give humble and reverent thanks to Almighty God for our deliverance." Longtime readers of this magazine know that the American and British peoples are, in large part, direct lineal descendants of the so-called lost 10 tribes of the ancient House of Israel. This surprising truth is explained in our free booklet The United States And Britain In Prophecy. "... Fear not [O Israel].... When you pass through the waters, I will be with you... " (Isa. 43:1-2). Allied amphibious assaults had God's protection on many occasions, as the generals and admirals testified. The U-boat, the blitzkrieg, the V-2 rocket — all the fruits of the Nazis' scientific genius could not prevent the Allied victory in World War II (Mic. 5:9). How strikingly was Deuteronomy 28:7 fulfilled for the Americans and British in 1945: "The Lord will cause your enemies who rise against you to be defeated before your face; they shall come out against you one way and flee before you seven ways." Yet some will ask: What about disasters like the Canadian defeat at Dieppe? Why the bloodshed and casualties? Longsuffering Britons have said: "How could a merciful God permit the Blitz of London?" Some who read about this marvelous knowledge of the identity of the English-speaking world cannot reconcile God's occasional intervention with the defeats, fiascoes and setbacks of the World Wars. These questions deserve an answer. And the truth is simply this: partial obedience brings only partial blessings (I Kings 18:21; Hos. 7:16). Absolute divine protection in war is only promised to nations that serve God totally (Ex. 14:14). How many nations are bold enough to claim that promise by obedience? God intervenes at crucial moments to punish excessively sinful nations (Gen. 15:16) and also to protect his servant peoples from extinction (Isa. 1:9; Gen. 49:24). This was his pattern anciently and we must understand that God's basic approach never changes (Mal. 3:6). The modern descendants of the so-called lost 10 tribes of the ancient House of Israel are indeed chosen to be God's servant people. But they have been unwilling to wholeheartedly serve God (Isa. 43:21-22). God describes them as "blind," blind to any sense of national purpose, their national origins and their imminent chastisement (Isa. 42:19). "I do not think that anyone can study the history of this nation without becoming convinced that Divine Providence has played a great part in it. I have the feeling that God has created us and brought us to our present position of power and strength for some great purpose. It is not given to us to know fully what that purpose is." Yes, even the spiritually blind. were once aware — or at least their great leaders acknowledged — that God Almighty gave them critical help to win World War II. But none, it seemed, really knew why. God reveals in Isaiah 48:9 that he intervenes for nations not because of any inherent righteousness or superiority but for his "name's sake." Woe is pronounced if national sins rise to the proportion they have reached today! Understand now why God has virtually abandoned the American and British people in recent decades (Jer. 14:7). God had a purpose in preserving the U.S.A. and Britain in World War II. They became the bastion of his great end-time work, a work that, from its American base, has girdled the globe. That work was the prophesied end-time proclamation of the true gospel of Jesus Christ (Matt. 24:14; 28:19-20). 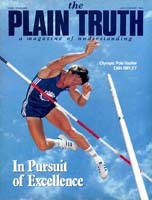 You are now reading that true gospel message of the kingdom of God in the Plain Truth magazine. In the 1930s and '40s God's time had come to lay the foundation for Jesus Christ's last warning witness to reach the nations in power (Mark 1:15; Mal. 4:5). Only North America had the financial capacity, the full religious freedom, the communications media and the ready access to Scripture to make this final warning and the announcement of the restoration of the government of God to this earth possible. So God helped the Allies win World War II. And that is the final, transcending aspect to the untold story of D-day.